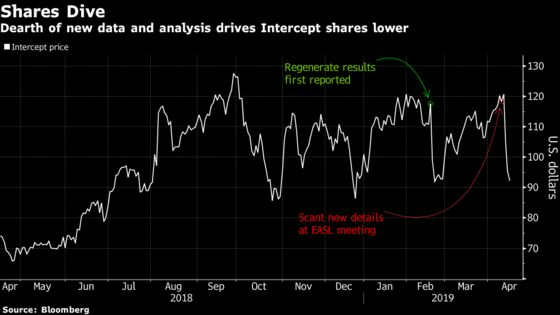 (Bloomberg) -- Intercept Pharmaceuticals may be paving the way for what will likely be the first treatment in a potential multi-billion dollar market to treat the fatty liver disease known as NASH, but doctors and investors at a key conference last week were disappointed by the company’s presentation, a Goldman Sachs analyst said. Two liver doctors at the European Association for the Study of the Liver congress in Vienna last week wanted to see a more rigorous analysis of all the patients that started in Intercept’s “Regenerate” study of its drug OCA -- or Ocaliva as it’s sold for a different disease -- and predict limited commercial potential, Goldman analyst Salveen Richter wrote in a note to clients. Intercept shares have dropped 23 percent over the past three trading sessions since Intercept’s presentation last week. Shares are about unchanged as of 11:22 a.m. Doctors were more enthusiastic around an earlier stage drug -- Madrigal Pharmaceuticals’ MGL-3196 -- according to Goldman. The bank rates Intercept a buy and Madrigal neutral. Goldman helped Madrigal raise cash in an offering in December.